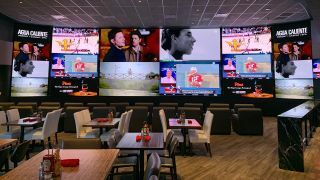 The Agua Caliente Casino Resort Spa in Rancho Mirage, CA has opened 360 Sports, a sports bar and restaurant offering more than 1,200 square feet of live sports action viewed on a multitude of large-scale LED displays. To drive the wall-to-wall sports programming, Las Vegas-based Advanced LED Displays selected Christie Spyder X80 and Spyder X20 multi-screen windowing processors. 360 Sports boasts 2,300 square feet of LED displays comprising a main LED wall, an LED bar back, a “Dogbone” LED wall and an entry LED wall, which surround table and bar seating. The video walls are fed by 19 DirecTV boxes for sports programming and 12 proprietary media players for Agua Caliente’s own media and marketing content. A Christie Spyder X80 drives the main LED wall, bar back, and Dogbone LED walls; a Spyder X20 drives the entry and the separate Center Bar video walls, which has an elliptical LED wall wrapped around its bar. The Spyders link to 4K LED controllers that feed the displays. 360 Sports boasts 2,300 square feet of LED displays comprising a main LED wall, an LED bar back, a “Dogbone” LED wall and an entry LED wall, which surround table and bar seating. A simple user interface makes it easy for bartenders and managers to leverage Spyder’s API for command and control. Accessing presets to change the looks on all the LED displays is achieved with just a button push. According to Martinez, 360 Sports has quickly established itself as a popular spot at Agua Caliente. It packed in guests for Super Bowl LIII. “As the property continues to evolve, the inevitable goal will be for 360 Sports to be ready to go as a sportsbook when sports betting is legalized in California,” he said.